You never know where the blues is gonna take you. 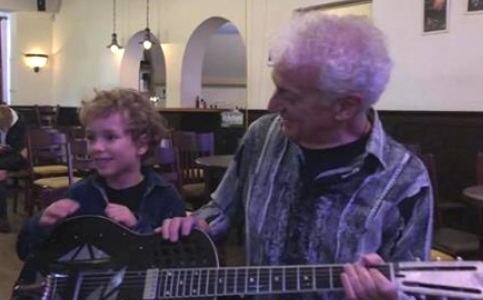 Last December, when a guitarist friend invited me to the 2018 Finnish Blues Awards, I thought: Why the heck not? Helsinki is just a two-and-a-half-hour flight from my home base in Germany. Any chance to see a new city and meet a new culture first-hand – even for 24 hours – is a chance I grab. And I knew this much: There’s no shortage of capable bands in Finland. Like the Wentus Blues Band, who I first stumbled upon 15 years ago in Dresden. Or the combo led by young singer Ina Forsman, part of the Ruf Records Blues Caravan 2016. Leading the pack is slide guitar goddess Erja Lyytinen, who has a particularly strong following in England and is a bona fide celebrity at home. There’s also Erja’s long-time (now former) right-hand man Davide Floreno – my host – a rock solid guitar player in his own right. 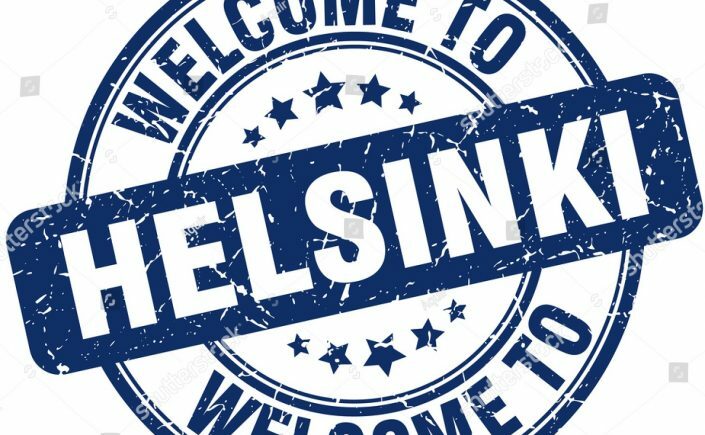 But beyond that, as I sat inside the black Mercedes sedan carrying me from Helsinki’s Vantaa Airport to the city center, I really had no idea what to expect. The first impressions were of a flat, barren, snow-covered landscape deep in a wintertime slumber. And boy does it get dark early. 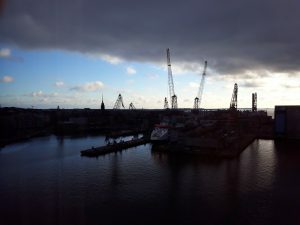 By four p.m., while I settled into my hotel room overlooking the loading cranes in the Port of Helsinki, evening had already taken hold. The Finnish Blues Awards bills itself as a “society, event and a marketing effort helping to spread the glorious message of arctic Finnish blues music.” That’s a wordy but accurate description, because the fourth annual awards presentation – held for the first time at the Nosturi live music club – was more a showcase and gathering place for Finland’s blues community than anything else. These blues awards felt nothing like a gala – not like the BMAs in Memphis. There were no five-course dinners, no evening gowns, no purple double-breasted suits. And, in fact, only a precious few trophies handed out. But there was live music. A whole bunch of it. Eleven bands on two stages, one upstairs, one downstairs, with nary a break between 7:30 p.m. and 1: 30 a.m. The constant stair climbing during this tightly scheduled, well-organized event would help to offset the calories accumulated at the downstairs bar, which served beer on tap and a good selection of the tasty and potent herbal liqueurs Finland is famous for. Nothing like a bit of exercise to go with your drinking. 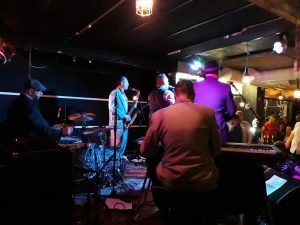 Kicking things off downstairs at 7:30 was Jay Kay & Blues Gang, fronted by singer/guitarist Jouni “Jay Kay” Kallenautio. He got things rolling with an appealing set of earthy roots music a la JJ Cale and guitar stylings reminiscent of Peter Green. Upstairs at 8:00: Ilkaa Rantamäki & The Bluesbrokers. The highlight of this classic rock-leaning venture was a compelling instrumental take on The Beatles “A Day In The Life.” Back downstairs at 8:30: Helsinki’s own Mudville 56. The trio’s real gone swinging upright bass blues and rock’n’roll kept the party moving. Back upstairs 30 minutes later: Maisteri T. & Lihan Tie. A harp-fronted quartet that delivered much of its set in Finnish. For a band with any kind of international pretensions, that’s a limiting choice. But, as I would discover as the evening wore on, the Finns sing the blues in their native tongue more than other European players do. Somewhere around 9:30 p.m., I tried my first shot of Salmiakki, a popular mixture of vodka and licorice extract. Some say it tastes like cough syrup. Now a cynic would tell you it was the beer I’d already drank, together with the Salmiakki, that had me warming up more and more to the live sounds on offer. I’d say it was the increasingly high quality of the music. Either way, the next four acts made a lasting impression. 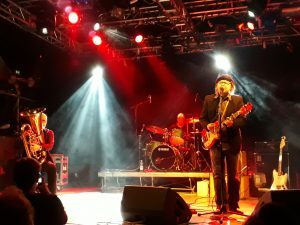 The Toreadors picked up where fellow Helsinki-ites Mudville 56 had left off, celebrating the occasion in a swinging five-piece set-up and adding an invigorating touch of ska to the rock’n’roll, R&B and jump blues mix. Back upstairs, a trio that won me over instantly: Jarkka Rissanen Tonal Box. Guitarist Rissanen – an institution in Finland, apparently – was the first player on awards night to truly evoke the spirit of the Delta. His gritty, authentic, down-in-Mississippi playing was complemented skillfully by tuba and percussion. The next name is quite a mouthful: Faarao Pirttikangas. Wiki tells me he’s been a part of bands called Cosmo Jones Beat Machine and Astro Can Caravan. What he’s doing now – or rather what he played during his solo set in the downstairs room – was a kind of off-the-wall stomp box blues not unlike that of jumpsuit-wearing, distortion heavy cult hero Bob Log III. Pirttikangas does it well enough to have earned Artist of the Year honors at this year’s awards. Dave Forrestfield, too, was a pleasant if less challenging listen. Like so many of the acts in Helsinki, this year’s award winner for Best Song steered clear of cumbersome rock influences and overblown solos. The blues he and his quartet delivered was lean, solid and danceable, with touches of R&B, boogie and rock’n’roll. My apologies go out to Palkintojenjako (yes, I had to look that up) and Turn On, acts nine and ten on this evening, respectively. After eight bands in four hours without a break, my ears needed one. 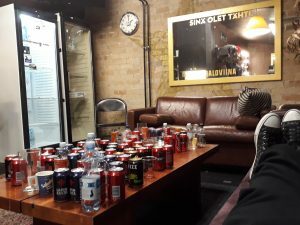 So after the awards were handed out around midnight, like most of the assembled, I retreated to the backstage area to help finish off the remaining cases of Koff, Fizz and Lapin Kulta. A not insignificant portion of the Finnish blues community had squeezed into the modest dressing room to talk shop over a beer. 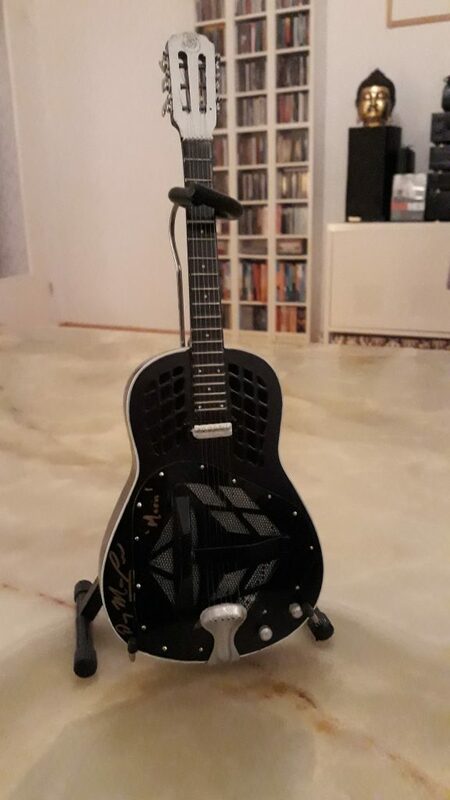 It was there I exchanged handshakes and addresses with Lena Lindroos and Matti Kettunen, who play the blues together as one half of 2017 award-winners Lena & The Slide Brothers. I traded likes and dislikes with Finland’s unofficial “Blues Minister” Esa Kuloniemi – a respected author, musician and radio host. There were promoters, festival organizers, dozens of musicians. The common thread: The relative lack of opportunity at home. Finland is a sparsely populated country that stretches to the Arctic Circle and has only so many venues and so many gigs to go around. With the chances of an international breakthrough unlikely to say the least, the Finns can only view the blues as a labor of love. In the slightly subdued but warm-hearted atmosphere backstage, I began to think of them as the True Believers. The night’s closing act, Million Dollar Tones, epitomized that. It was now after one a.m. The upstairs concert area was just about empty of spectators. The few remaining hangers-on left were tired and unresponsive. Did it faze the last band standing at the 2018 Finnish Blues Awards? Maybe. But if it did, they didn’t let the circumstances dampen their spirits or affect their performance. 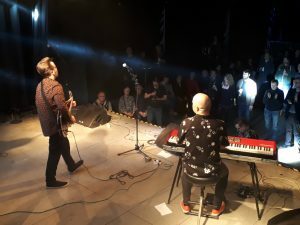 The six-piece combo delivered rousing rock & roll and rhythm & blues propelled by a pair of chugging saxophones and the dynamic singing of frontman Antti Pajula. Just one more really strong set on a night on which Finland’s True Believers put their best foot forward.